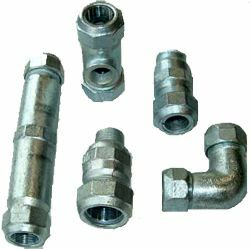 Galvanized Compression Fittings For the connection of new pipes and repair of existing pipes. Couplings Flange Adaptors DI-epoxy-coated - galvanized --"Lloyds approved"
Service pipe connections for Gas, Water, Mechanical, Marine and Shipbuilding Industry. Compression Fittings offer an excellent jointing system for both the repair and jointing of new service pipework. They are suitable for Steel, PVC, PVC and Copper pipes, as well as a transition connections between these materials. Hegawa Compression Fittings offer a comprehensive range of couplings and fittings specifically designed for service pipe jointing within the Gas, Water, Mechanical, Marine and Shipbuilding industry. Rapid installation: a fast and easy installation is assured with the unique design of the end nut. No special tools are required. End load bearing eliminates the need for anchoring: the fittings incorporate a specially designed locking arrangement which ensures full end-load performance. 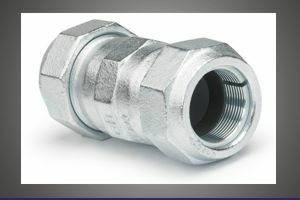 Corrosion protection: all fittings can be supplied with a galvanized finish. Optimal repair system: the high volume gasket provides a permanent and reliable seal on old and corroded service pipework, an important requirement when carrying out repairs. Special, fire approved, type available for temperatures up to 650 °C. Angularity can be taken up to 3 °. Hegawa Compression Fittings are available in a large range of sizes from 3/8” up to including 2” (20mm-63mm). Available in different lengths, short type, long type, elbows, tees, end caps. Gaskets: NBR approved for Gas and Water.